We were supposed to have a nice weekend, then it changed to rain, but we lucked out and it was nice, most of the time. Today the rain held off but it was freezing at the beach, but that didn't stop me, lol. I had gloves and a hooded hat to keep my face warm. Even so, I still got cold, so we stopped and took a break and came back when more of the tide was out. 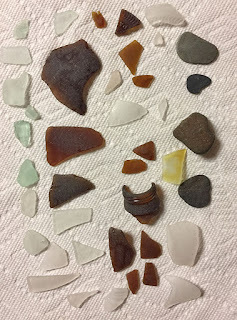 I really didn't expect to find much at this beach, have been going there for years, but never for glass. 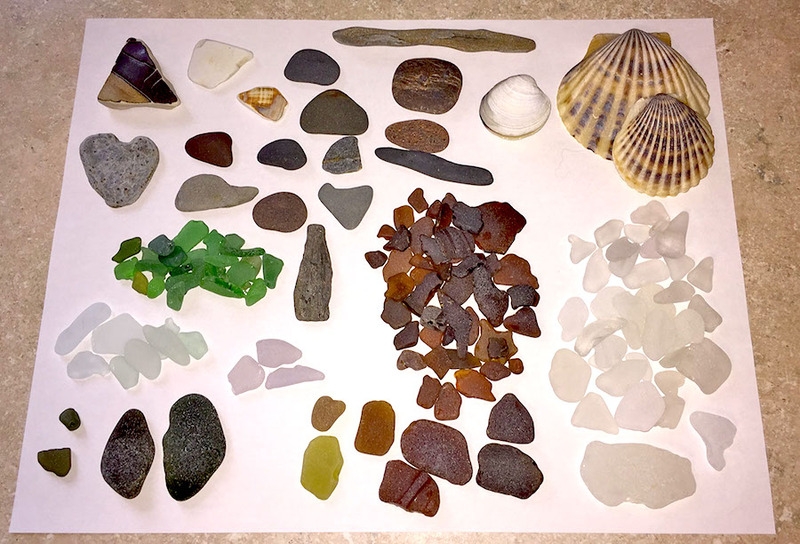 I was pleasantly surprised to find so much and secret places to find glass that was rounded and polished. I had to much to lay each one out, lots of weird pieces and lots of beautiful sea glass, so tomorrow I can sort it out, and store it in the appropriate jar. 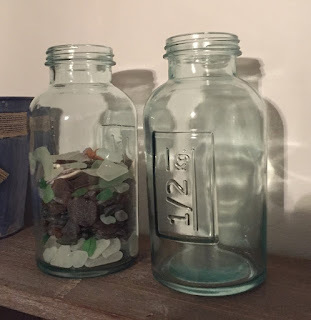 I am not sure what I will do with the bottle, but I have a friend who does beautiful art with glass and melded one into her stained glass piece, so maybe I will share the larger glass with her or get creative and try something myself. I do have an idea for my first piece, so I will work on that, this week. 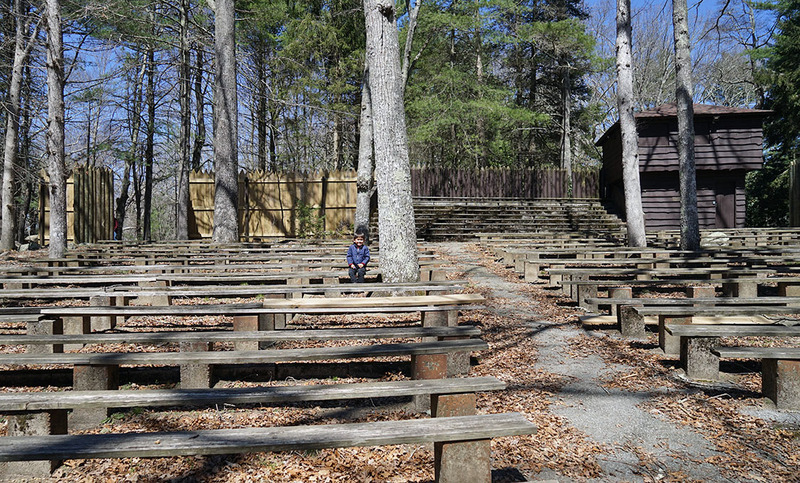 Our camp was nice, a few people, but not crowded. 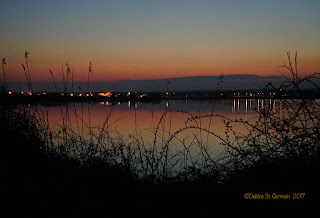 We had a beautiful view of the inlet and at night, we watched the sun set and the lights shining across the water. We tried to watch the sunset from the beach, but the fog took over. Luckily we just had to turn around and see this beautiful view of the moon over the lighthouse. We spent most of the day, at the beach. 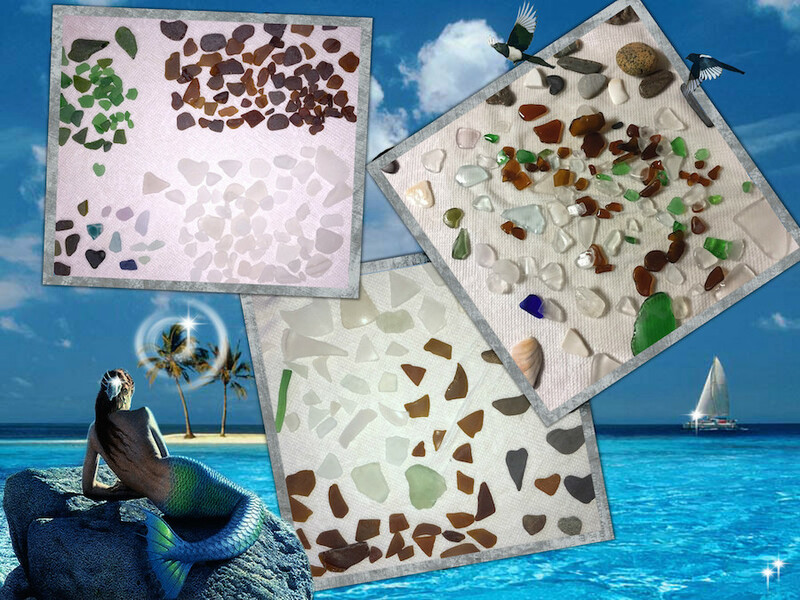 We had miles of beach to walk and portions where the glass could be found, so lots of exercise and fresh air. We got to enjoy watching the sandpipers running around the beach, they rarely stay still. 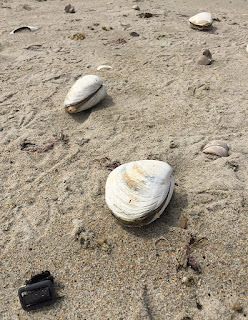 Another thing we found along one stretch of beach was, clams, hundreds of them and these are easily, 6" in size. The tide washes them in and they just sit on the beach and die, what a shame. The seagulls will eat them, but it seemed they were more interested in fighting over the crabs. Even with the cooler weather, we had a nice time and enjoyed nightly fires. 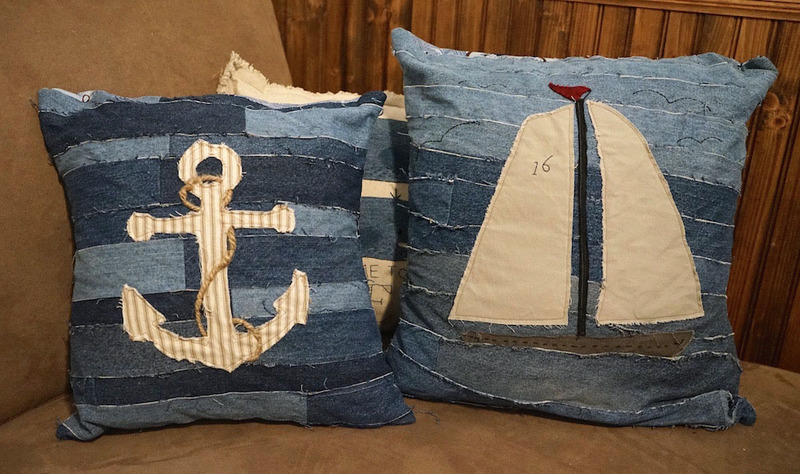 No sewing got done, we were all too tired at night to do much buy sit and go to sleep. Even Bean was tuckered out, hours and miles of beach play and he was out for the night. I hope you all had a wonderful weekend. 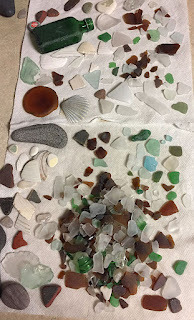 This weekend, we did our usual beach combing. I want to take advantage of the good beach while I can, in a few weeks the campground will be open and they charge 20.00, to use the area. 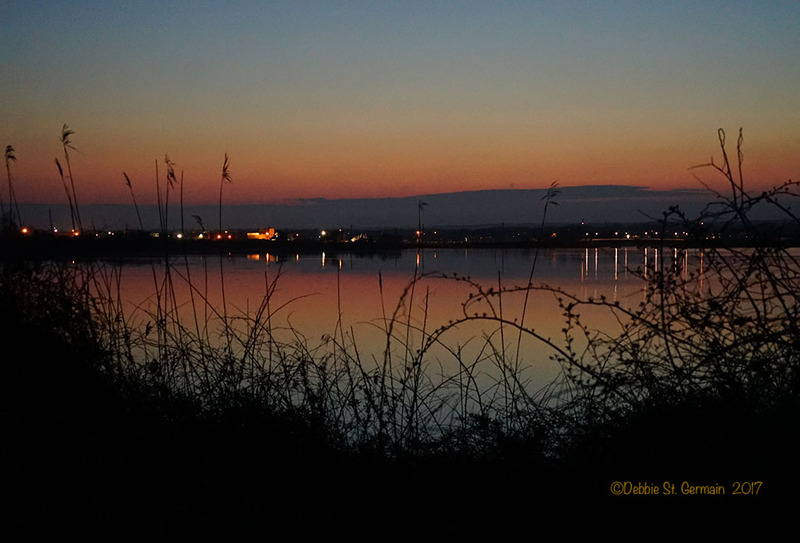 The campground has beautiful views, but a bit crowded for me and hard to get in. 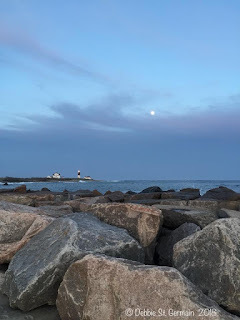 It is always good when I can hit the tide at the right time, when it is going out, I can stand at the edge of the rock piles and grab the glass that gets thrown up and find some hidden under the piles, you can find more, as well. 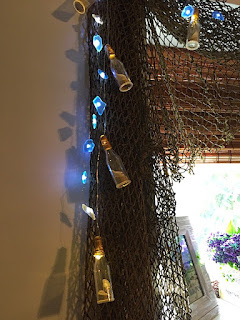 During our shopping trips, I got some shell lights for my beach tree and I found these smaller bottles that are perfect to help separate the glass by size. 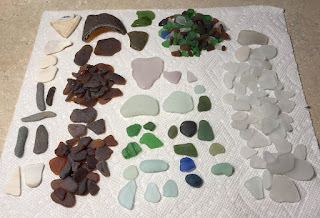 I have a large one for the big pieces and one for the tiny pieces, so these will be for the medium sizes, I just threw some of the glass in, that I found this weekend. On Sunday we took Nick out for a hike. 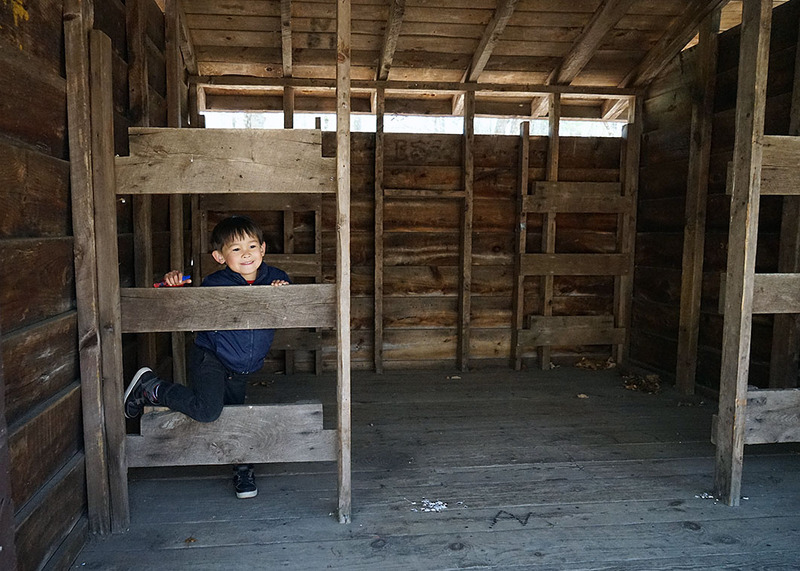 He loved exploring the buildings and climbing on the rocks. We had a nice view of the pond from the tower. 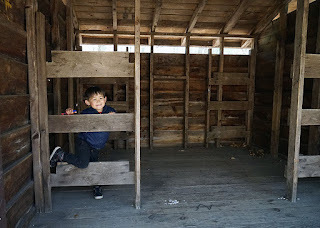 Nick was curious about the little bunk houses, not so sure I would want to sleep in one. 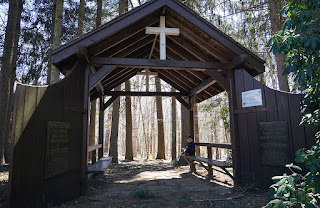 This is a camp for boy scout troops. It is a big area and they have several buildings, including an area for services. 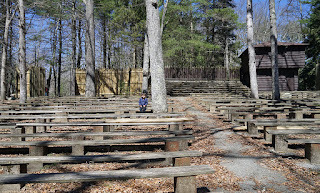 The building actually leads to a larger amphitheater, where they have gatherings and services. 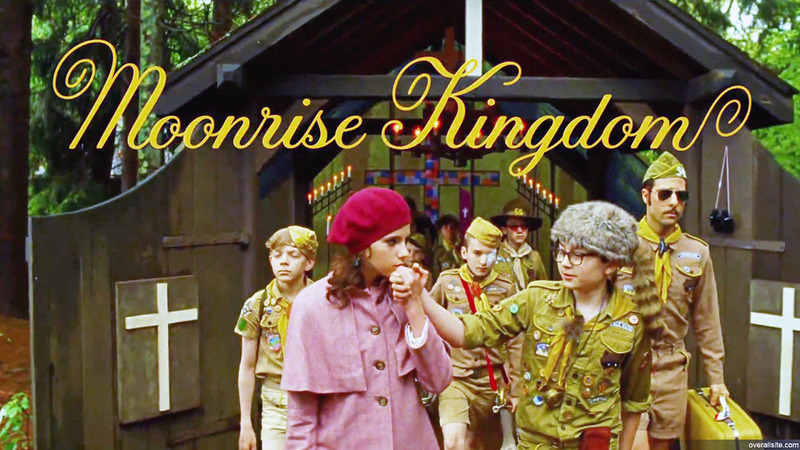 This chapel was used in the movie, Moonrise Kingdom. 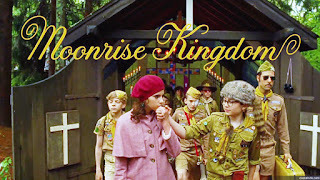 It was filmed in Rhode Island and this camp and the surrounding forests were we hike, were also part of the movie. My Sister in Law had a small part, Bruce Willis knocked on her door, looking for the kids. They wanted authentic, older homes and hers is off the main road. I finally sat down and made some pillows. I wanted to try the denim materials I have been saving and do something simple, with raw edge. On the ship pillow, I used a think base fabric and laid the denim strips on top. I sew them down on one edge, over lapping each edge. The sail and ship are also old pant material. The anchor, I did not use a base material. I sewed one strip to the first strip, then the one below. The anchor was some old ticking, I had. The pillows are 18" and 16". They will ravel more as they get used. Next I need to start a quilt, I have lots of jeans and I just cut some more, today. The ship I drew out on paper to make templates, the anchor I got from a coloring page. Since I used pillow forms, I didn't want to leave an opening, since it would have to be wide. I decided it was time to try an envelope back and I didn't do too bad, considering I have no idea what I was doing and just figured it out. 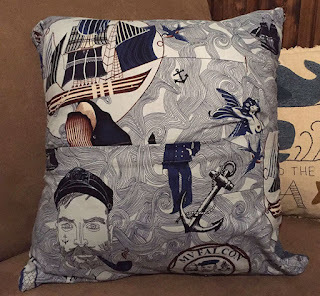 The material was from my friend Karen, I thought it was a fun print for these. I hope everyone has a nice weekend. We have some decent weather so hoping to get out for some walks. We were supposed to be camping this weekend, but it was windy and cold yesterday and today we got rain and wind, so I cancelled this trip. Hopefully the next one will bring us better weather, not fun to camp if I am stuck in the trailer all day. 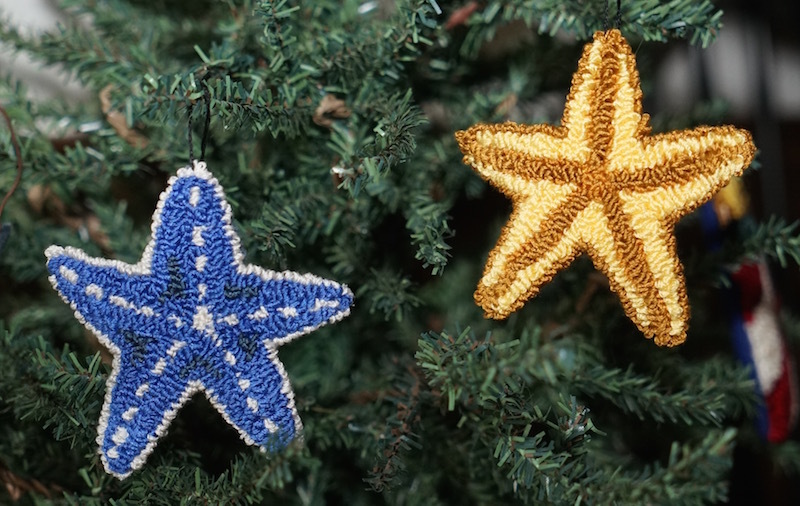 I wanted to try some wool starfish and I love how they came out, but I couldn't get a decent photo, you can never get the look with wool and floss, especially with flash. 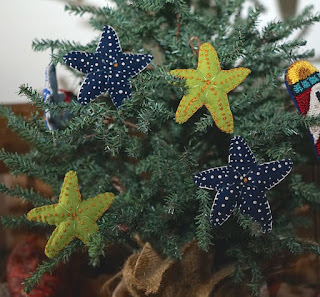 I modeled them after real starfish and the actually colors, and I had the perfect lime green in my thrift stash. I added a little stuffing and used a colored blanket stitch to mimic the border color on the starfish. They are easy to do and would make fun bowl fillers too. You can just draw out the starfish by hand or use a coloring book template, then have fun with the colors or look at real starfish online. 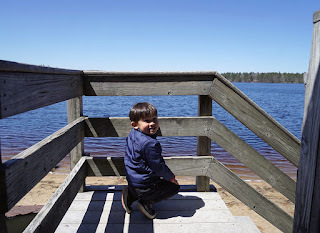 On Saturday we took advantage of the beautiful weather. I was surprised that there weren't that many people at the beach, but that means more glass for me, lol. We hit the tide just right and even when it goes out, the waves come up at different heights and crash against the slopes, and drop glass off. 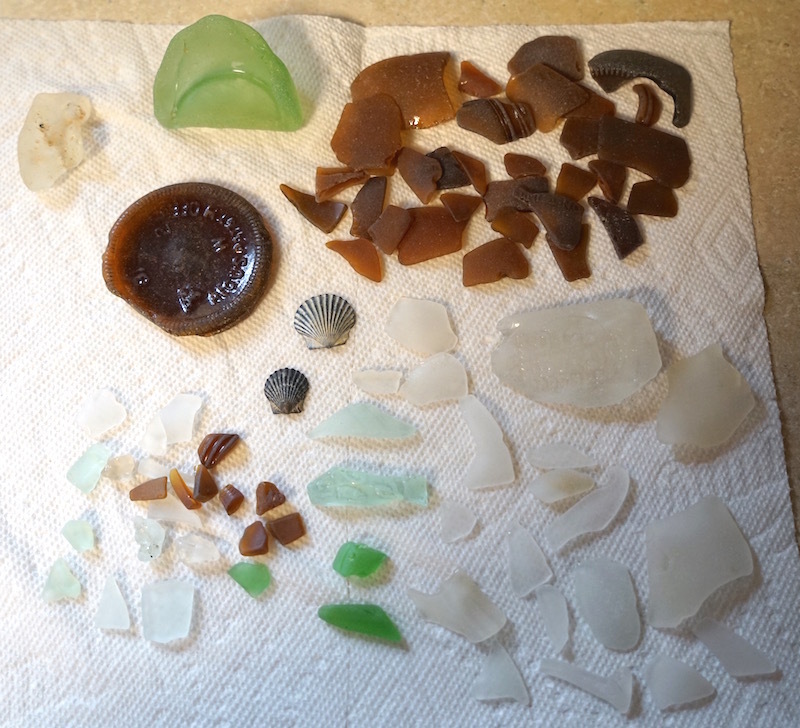 I was able to walk up and down a section and catch glass as it was swept up, so I got a nice haul this time. Bill was too lazy to bend, so he sat in the rock piles and dug for glass, he found me the pink heart. Some of the larger pieces are around 3", so you can tell what sizes they are. 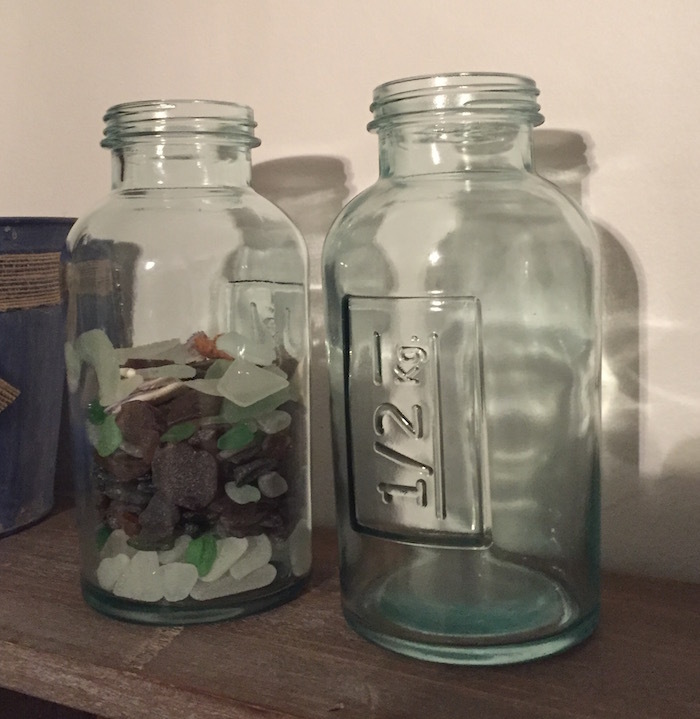 My big find was the round one in front, that is a cobalt blue glass, a rarer find. We also did some shopping and I got a plastic container with compartments, so I am putting some glass by types, then I can bring it upstairs and play with design ideas. Another great find this week was a large white, rusty pail, with a blue lip, the perfect garbage can for my beach room. I wanted to try some starfish in punch needle, so I looked online and found some pretty colored starfish that were not too detailed, perfect for punching. The yellow and gold one needs a better eye, maybe I will just do a large french knot. The blue one has main dots and lots of little white dots, but I just did a simple punch going up, so it is not exact, but close enough. There are lots of fun starfish and beautiful colors, I may try some larger ones and try more detail. And we went to the dog beach, and found some nice glass. 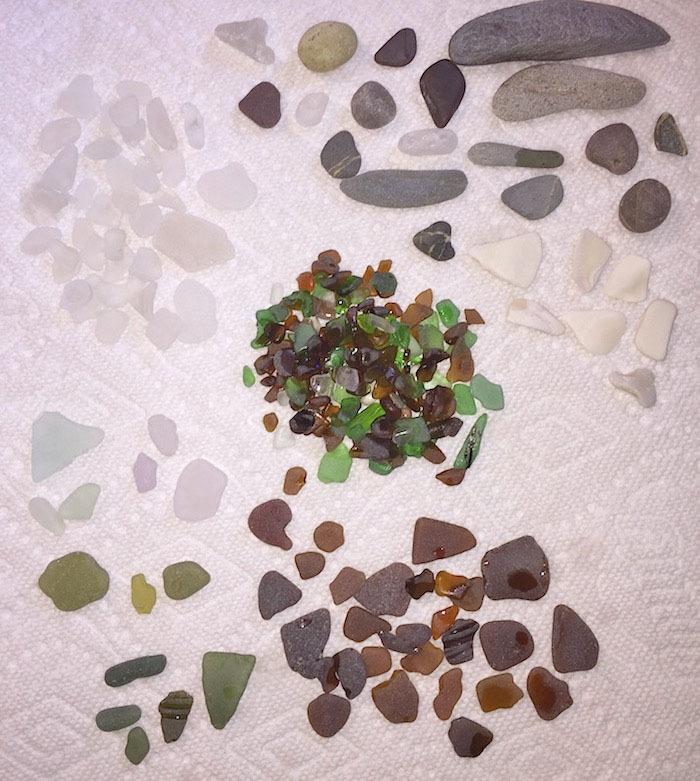 The glass on the right side is from the dog beach. Then we got out early and hit the island and I found more glass, a lot more glass. 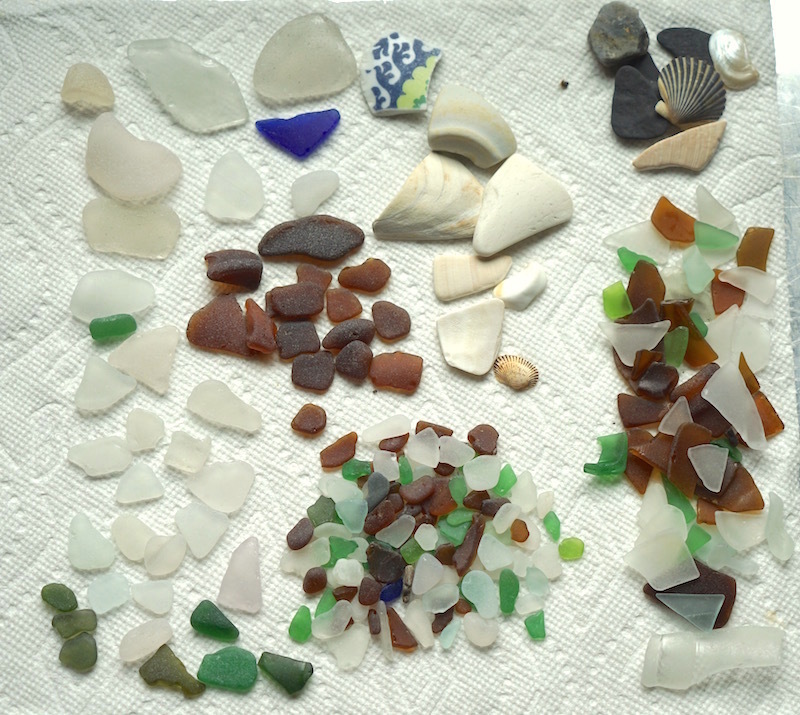 All the glass on the left is from that beach. Today I just wanted to get out and enjoy the nice weather. One more day, then more cold coming in. So, we went back to the dog beach, I figured we could just relax and walk and if I found anything, that was a bonus. Well, we hit the beach at the right time, it was all over the place, I found big chunks just laying on the beach. So, I have a lot more glass, lol. I guess it is time to start making things with them. I do keep the best, older glass in a heart shaped bowl, those I keep to look at. I like the ones that are a bit clearer and flat, they will work nicely in art pieces. It is hard to see, but that blue piece is in the shape of a fish, even the markings on the bottle, made an eye and fin, definitely making something with that piece. And, I finally put up the lights on my netting. 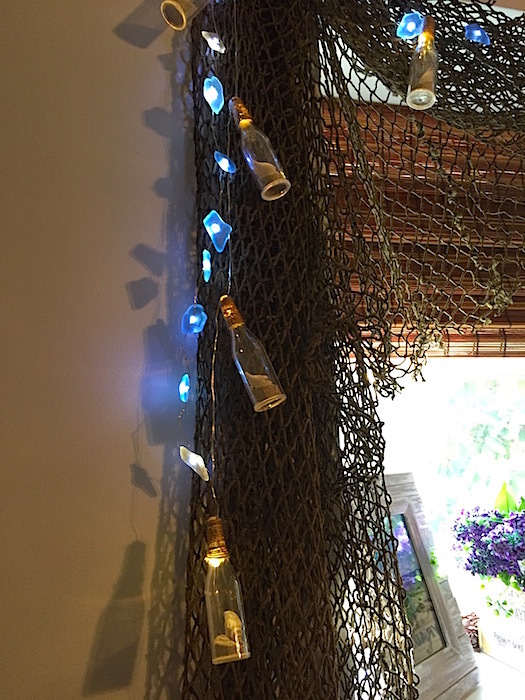 I got fake sea glass and bottle lights. They are heavy, so I put up some cast iron holders for the netting, and that holds the weight of the bottles. Now I need to get started on some pillows and a quilt, as well as, art work for the walls. This weekend, I got bored. So, I decided to make something new to decorate my seasonal tree. Spring still seems like winter, so I went with a summer theme and my favorite subject, the beach. 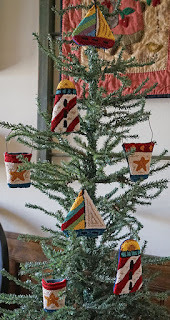 I made the designs simple to make it easier for making into ornaments and can be machine sewed. I like how they came out and I did them over the weekend, so they work up quick. I also made them so you can do the sailboats or pails in different colors, a great stash buster, for those floss boxes. I am getting a lot of requests for a pattern, so I will work on that this week, hopefully I can get them done in a few days. I always like to make things first, then I make the pattern and adjust things to make them better, where needed. 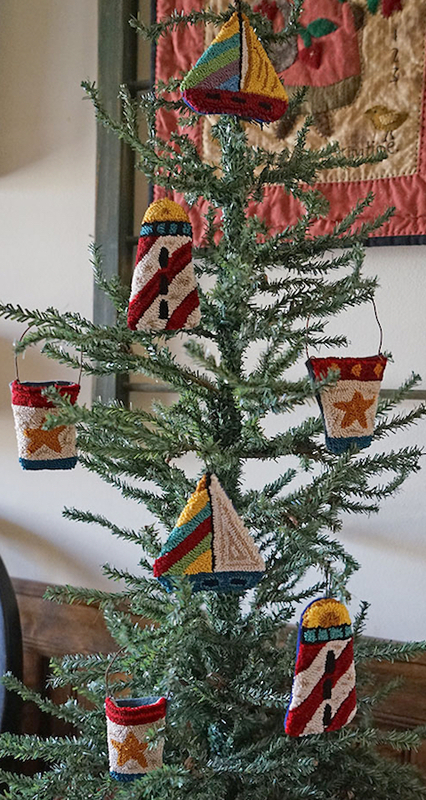 I put them together for the photo, but I am thinking of adding some starfish lights and maybe some wool starfish, and maybe a nautical flag for the top. The weather has been too cold to get out, but today I just wanted to walk the beach. 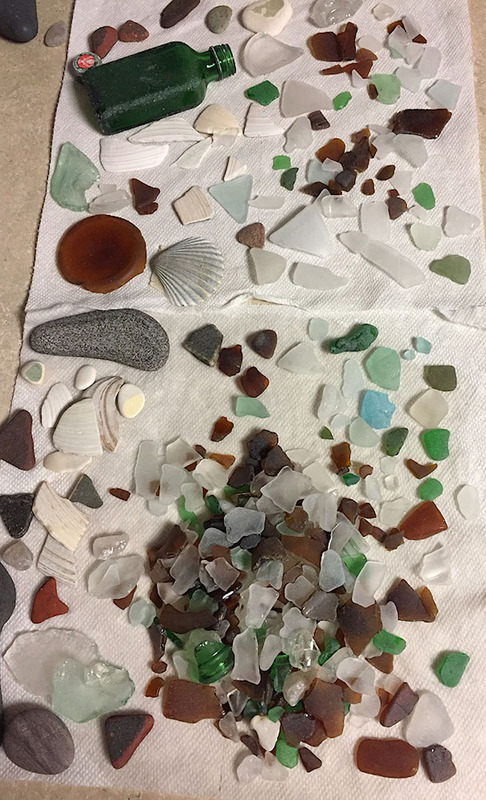 It was cool but nice and I was able to find a few nice pieces of glass. This weekend we were supposed to go camping, but now they are talking about a rain storm coming in, so we may stay home and enjoy one good day before it comes in. Hopefully it will hold off long enough to get out in the morning on Sunday, but Monday will be the worst, so I don't think it is worth the trouble of packing up and preparing for a short trip. I have another at the end of the month, so I can add an extra day to that. 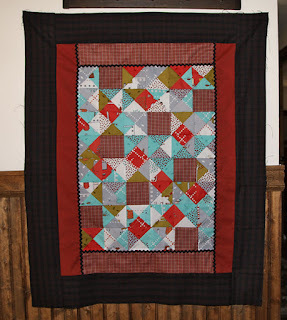 My finish today was supposed to be my stocking quilt. I need to put sashings on the new ones and then put them together. That way I can see how large it is and if I need more, I think I will just keep it as a large lap quilt. But, my shoulder went out and I have a bit of a flu bug, so I decided to work on a punch needle. I enjoy doing punch since there is little work to put one together and I have all my floss in boxes so I can sit and relax, without having to look for things. 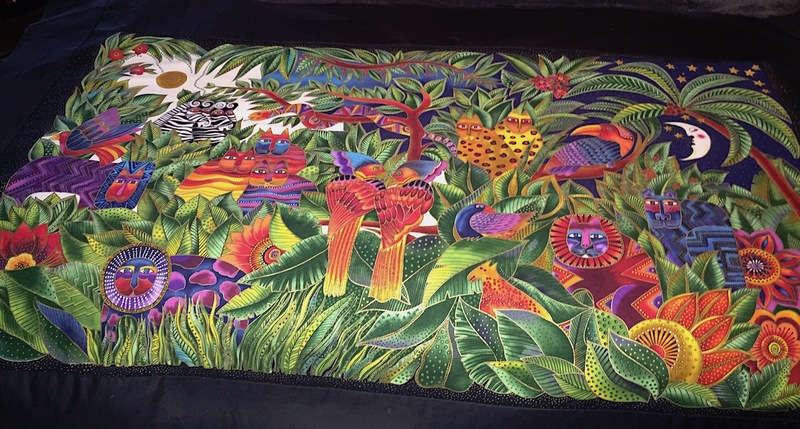 This design is from Tonya of Mad Hen Primitives, in the Spring 2016 issue of Primitive Quilts and Projects. It is a rug hooking pattern so I scanned in the finished photo and drew from design from that. 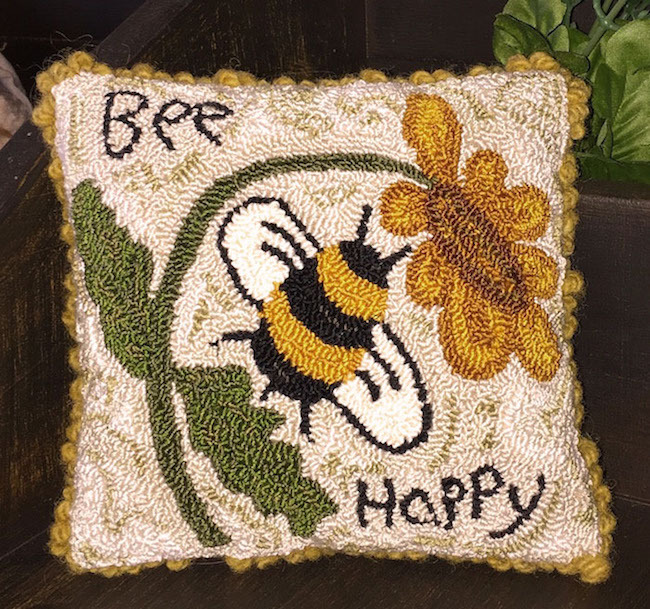 I added the words for fun, something happy to work on. I was doing well until my needle broke, the little plastic sides that hold it in the holder. So, I found another and was working but then the holder broke. Luckily I have two, so I used the other, but with the bad needle, I realized after that the punching is a different height, but it still looks ok. I had Bill order me a new one with prime so it comes in tomorrow. I do miss punching and designing, so maybe while I am camping I can come up with some new designs. 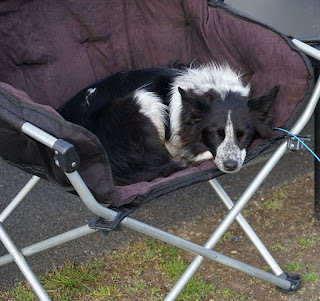 We plan on camping next weekend, today it was snowing again, lol. But, the weather looks nice on Saturday and Monday, and maybe rain on Sunday, so I am hoping it stays away. 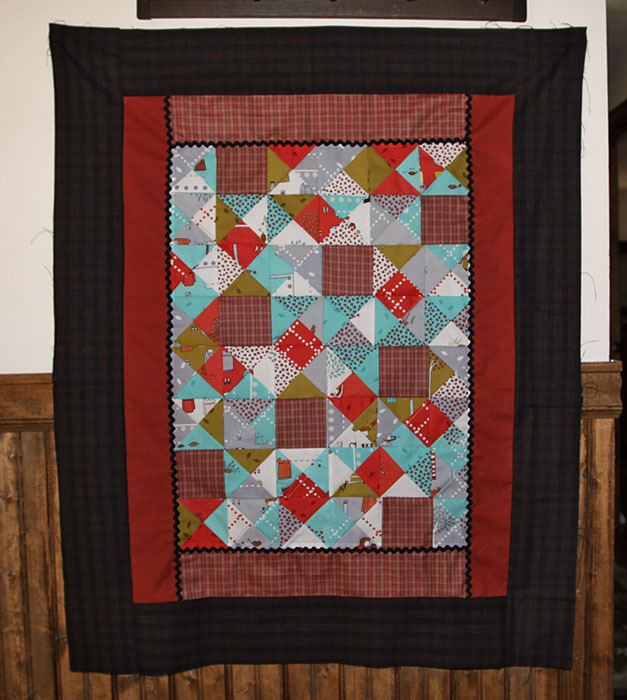 Hopefully I can get my quilt together this weekend so I can hand quilt it at camp. 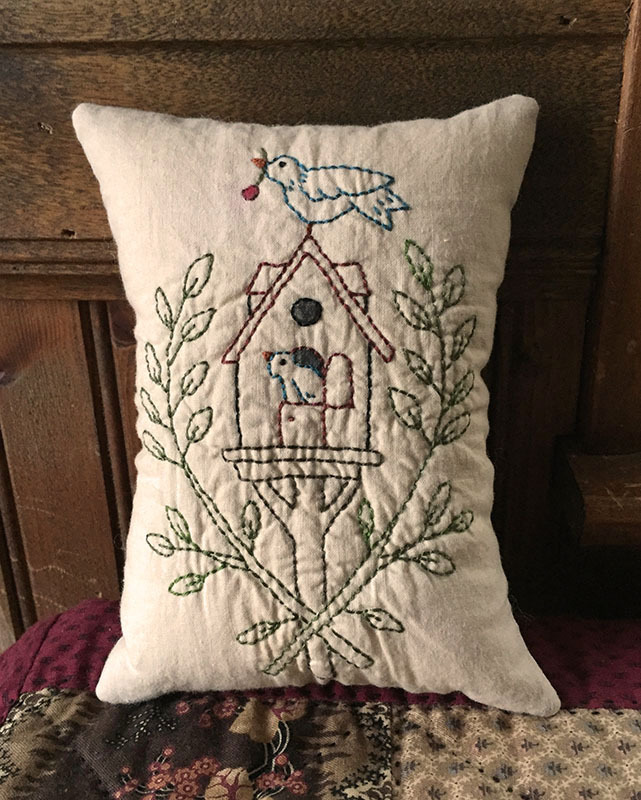 The pillow is 5 1/2" x 5" and finished off with a piece of rug yarn. I bunch it up, as I sew it on to get the bumpy edge. I hope everyone had a wonderful Easter weekend. I woke up sick yesterday so no dinner with the family, Bill and I took it easy and he took me to the beach for a little while. There is nothing like fresh air and hunting for glass, to take my mind off my misery. 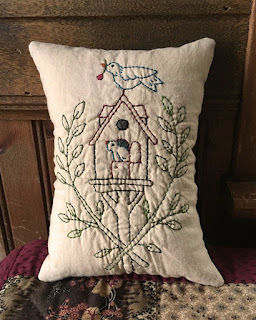 It is also a new month which means a new stitchery from Kathy Schmitz, from her One Stitch at a Time Club. I still need some more sachets, so I made another with this design to place with my wools. It was nice to have something small to keep my hands busy while I rested. Of course I got out for some more glass hunting. 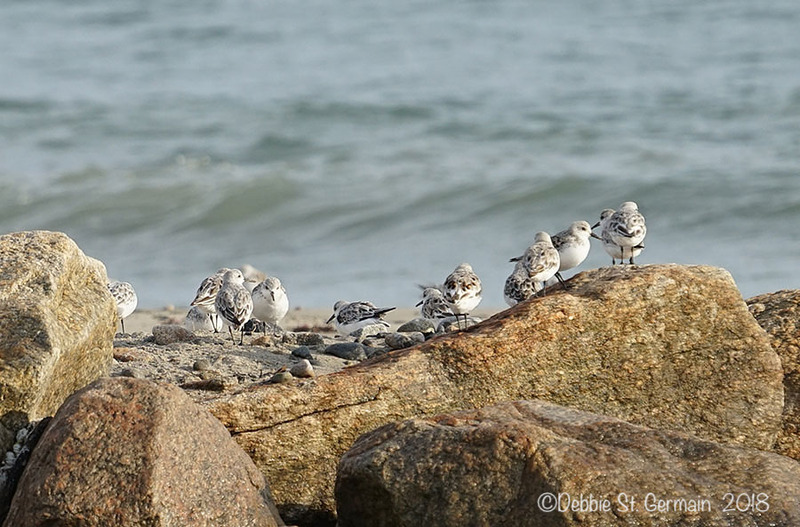 It is the best time with all the winter storms and before the crowds hit the beaches. We did have the kids over on Saturday for a fish fry, and when it was time to go to church I opted to stay home, I guess I was getting hit with the bug and didn't realize it. But, I enjoyed the time with the kids and beach combing, so it was still a good weekend. The two larger rocks at the bottom left are green, one is a lime shade and one an olive, but the years of tumbling has made them dark to the eye, but you can see the colors when they are held up to the light. You would be surprised at how many I find, just laying on the ground, people do not realize it is glass, especially with the brown. The yellow glass was a rare find for me.